The newest game from the Candy Crush Franchise! With updated graphics, fun new game modes and a host of friends to help you blast through hundreds of levels! 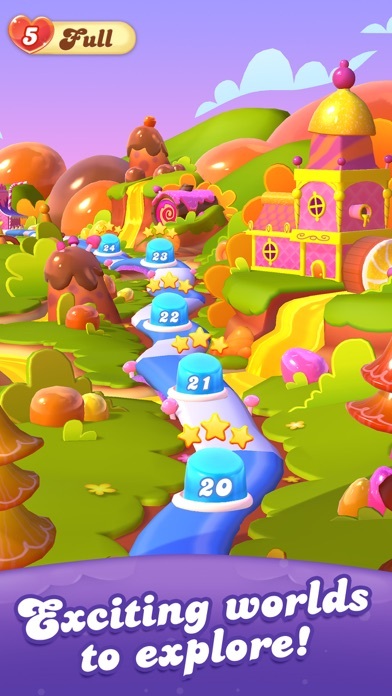 Your Candy Crush Friends have been scattered throughout the Candy Kingdom - Join this match 3 puzzle game to find them! 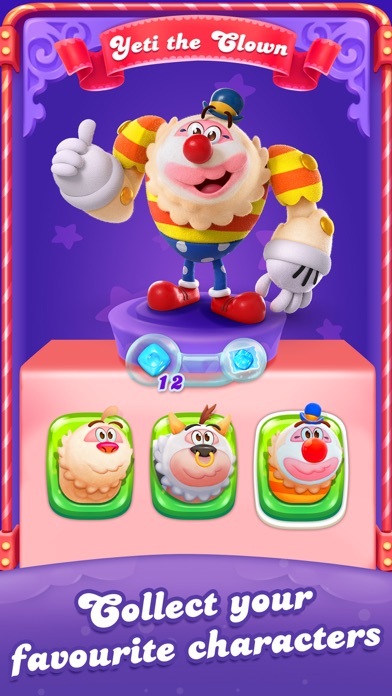 This friendly bunch have their own unique powers to help you to create sweet candy combinations and blastthrough blockers! Switch and match candies to unlock rewards, friends, and sweet collectable outfits! 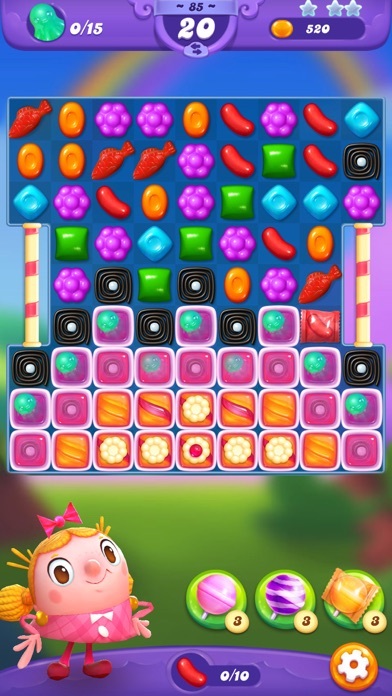 The more candies you collect the greater your power on the game board! This fun new Candy game is filled with delicious treats - cookies, jam, chocolate and more! Your favourite game modes, but sweeter than ever! Candy Crush Friends Saga features: •	Hundreds of levels to play – collect your favorite friends along the way! 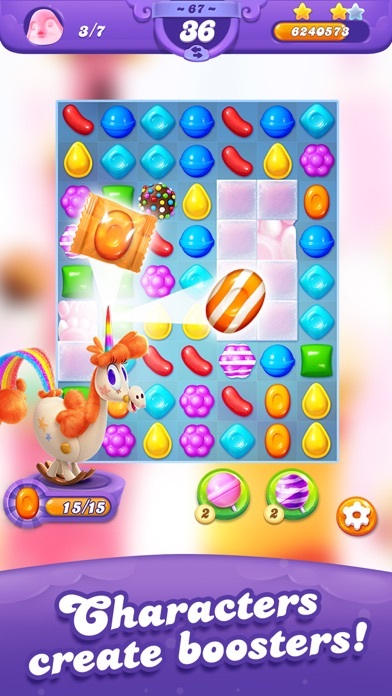 •	Your Candy friends are your allies – they are ready to help you blast through levels! 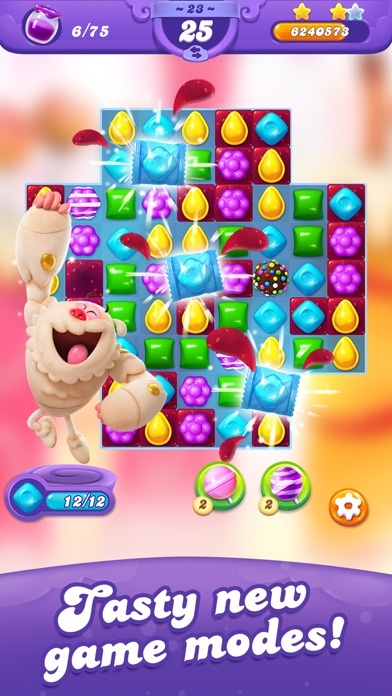 •	Watch Yeti and his friends dance when you win levels! •	Fun new game modes; dunk the cookie in the chocolate & free the octopuses and the mammoths! •	Keep your friends in a sticker book and change their outfits! •	Explore sweet new worlds in 3D! •	Easy to play but challenging to master! •	Play whenever, online and offline. Easily sync the game between devices and access full game features when connected to the internet. •	Take on this epic saga alone or play with friends to see who can get the highest score! If you need help and support, you will find helpful and extensive FAQs in our in-game Help Center, click the ? to launch it. Share opinions and have sweet discussions with other members of the Candy Crush Friends Saga community. 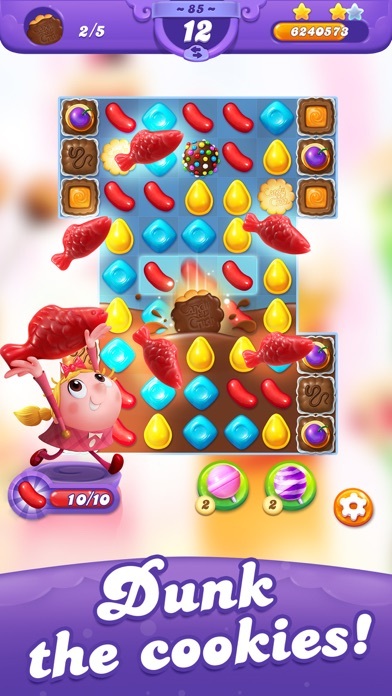 https://community.king.com/en/candy-crush-friends-saga/ Visit www.candycrushfriendssaga.com and discover delicious game guides and tasty blogs to satisfy your candy cravings. Candy Crush Friends Saga is completely free to play but some optional in-game items will require payment with real money. You can turn off the payment feature by disabling in-app purchases in your device’s settings. Without buying something. I played one level over 50 times and just couldn’t beat it. At that point, it’s no fun. This is more fun than I thought in the beginning. I was only playing while in the waiting room for candy crush. Now, it has grown on me. It's entertaining. The characters are fun...the game decides when you move to the next level...but, that's ok as I play it to kill time. This game is definitely amazing. It’s another money pit, but I do like to play. I’ll typically run out of lives before I’ll use coins. With all they said THANK GOODNESS YOU ADDED THE BUTTON TO GET RID OF TIFFI’S ANNOYING ANIMATION. I really wanted to punch her face. I hated waiting for those characters to stop their silly intro to start playing.